You’ve marked the date on your calendar and it is finally here. You took a few days off from work, or cleared your afternoon, and now the time has come. Maybe you’re getting that smile make-over you always wanted. Or maybe it’s just time to remove those pesky wisdom teeth before they throw your pearly whites out of alignment. Whatever the procedure, you’re going to have oral surgery. While oral surgery (or any surgery for that matter) is rarely fun or something people actually look forward to, you should never go in feeling unprepared. A better, healthier smile is waiting for you on the other side, and with a great oral surgeon and some prep, you are well on your way to a smooth recovery. Dental Implants – Dental implants are frequently the best treatment option for replacing your missing teeth or tooth. They are long-term and natural-looking replacements that are surgically placed into your jawbone. Tooth Extractions – Having a tooth removed due to decay, disease, crowding or trauma is called an extraction. Wisdom tooth extraction is one of the most common types of extractions. Sinus Lifts – A sinus lift moves your sinuses to protect them from upper molar dental implants, and/or to protect your sinuses by making room for a bone graft that will then be used to support your upper molar dental implants. 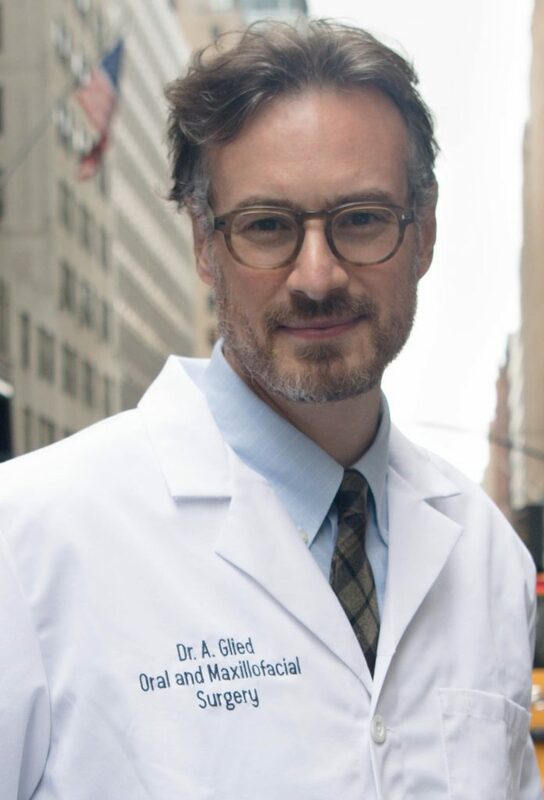 Les Belles NYC is honored to introduce the newest member of our growing team, Dr. Allen Glied, oral surgeon extraordinaire and our patient’s new best friend. Dr. Glied is the Division Chief of Oral and Maxillofacial Surgery at St. Barnabas Hospital. He is also a double board-certified oral surgeon with an extensive background in oral surgery procedures and anesthesia. While Dr. Glied can answer any questions you might have related to your specific procedure, below are some general tips and things to know related to oral surgery. Aside from remembering to show up a little early for your procedure so you can take care of any paperwork and ask the doctor follow up questions if you have them, here are a few more tips to know in preparation for your oral surgery. Be gentle the day of. Do not disturb the surgical site on the day of your surgery. Post-operation, avoid rinsing vigorously or brushing the area(s) for 24 hours. No smoking. To clarify, patients should NOT smoke for at least 72 hours AFTER surgery. Go home and rest. After oral surgery, your top priority is to rest! It goes without saying but for those who are always on the run or have busy workloads, it is vital that you clear your schedule and calendar to ensure you have proper time to recover from your procedure. If you received a general anesthetic, you should return home from the dental office immediately upon discharge. While home, lie down with your head elevated until the effects of the anesthetic have worn off. No driving. Seems obvious but after surgery, you should absolutely refrain from driving! If you are recovering from the effects of the anesthesia, then using appliances, equipment, or any heavy machinery is a big “No-No.” You could harm yourself or someone else. If you were driven to your dentist appointment, have someone pick you up and take you home. If you walked to the appointment, arrange a car to take you home and/or get a friend to pick you up. Expect dizziness. Be aware that you could feel very dizzy after your surgery. So walk with caution and refrain from sudden position changes that could cause you to feel more faint or nauseous. No tough decisions. Avoid making important decisions after oral surgery. People often experience some level of mental grogginess when recovering from the effects of general anesthetic. Try to avoid any serious or sudden decisions while you are recovering until the anesthetic has worn off. Expect nausea. While not everyone has the same response to anesthesia and medication, you might feel nauseated or sick to your stomach for a period of time following the surgery. So be sure to consume clear liquids for the first 24 hours. You may then proceed to soft foods until you are given the go-ahead from your doctor to resume your regular diet. Stop the bleeding. Follow the doctor’s instructions for stopping the bleeding and definitely expect that you’ll need to use gauze and pressure to stop any bleeding following surgery. Depending on the procedure, a certain amount is to be expected. The doctor can advise you as to when you can expect to experience less or no additional bleeding. Ice, ice, baby. Ice will be your friend after surgery to prevent swelling. Apply ice packs in 30-minute intervals on and off for the first two days following your surgery. If you were prescribed medicine, be sure to continue taking it as directed. Also, make sure our dentist is aware of any medications you have been taking prior to surgery just to ensure that there are no complications with the general anesthetic. Les Belles NYC is here to answer your questions, provide consultations, and discuss alternative treatment options if you think you might need oral surgery. Schedule an appointment with us (212-804-8884) today or stop by our office in the Graybar Building at 420 Lexington Avenue Suite 228 and discover how we can help keep your smile, and oral health, brilliant and bright. Next post: Yes, You Still Need to Floss!